High in the north, over to the east, Trieste dazzles with its waterfront and horrifies with its history. Name-checked in Churchill's famous Iron Curtain speech, the 20th century saw Trieste switch from the Austro-Hungarian Empire into the Italian fold. But that's not all. Trieste offers so many things to do, from drinking hot chocolate in the footsteps of James Joyce to wandering around tourist-free canals. Top tip: visit Caffe Tommaseo for great coffee and an interesting glimpse into history. Head south to the steep, sunshine-flecked coast and, quite literally, walk the path of the gods. It runs between hot spots Amalfi and Sorrento yet provides solitude, authenticity and tourist-free eateries. Swim in the sea at the start and end of the day and cap it all off with limoncello. In this region, this is authentic, and you'll walk surrounded by lemons. Insider tip: combine a walking trip with a look at Vesuvius. Everyone and his wife (or her husband) knows about Tuscany. Those trees that stand tall and pierce the sky. Those rolling hills. That appearance in Gladiator. What many people miss is just how beautiful Umbria is, and she only lives next door. Look for slow food, the gardens of Assisi and Etruscan remains that are older than ancient Rome. Carpino overlooks the twinkling Lake Varano, which spills on down through the olive groves to the popular beach resorts of the Gargano National Park. And every year, this village of 5000 welcomes back its travelling sons and daughters, those who left to find work. What began as a family sing-song and long stories told over deep red bottles of wine has evolved into the region’s biggest folk festival, attracting crowds from all around. The multi-generation spirit remains, though, as grandmas and grandpas (nonnas and nonnis) take to the stage belting out haunting melodies and giving accordions a good work out as darkness falls. Insider tip: hire a car from Barri Airport and enjoy drives through the rich forests and sandy beaches near Carpino. Let's face it. Italian food tastes good. Really good. But only if you know how to make it well. And where better to learn than in Italy? Don't just spend your time eating. Learn how to make a real ragu as well. Via ferrata means “iron path” and it’s an adventure sport that began as a survival mechanism during the dubiously named Great War. The bloody, icy dispute that straddled the Dolomites during the First World War left the Italians in trouble. Just a brief hike from the fashionable ski resort of Cortina, young men battled for their lives on the mountainous border between Austria and Italy. While the Austrians excelled at mountaineering, Italy found itself with soldiers more used to the sun and sand of the south than the spiky peaks of the north. Their army included men who had never seen the snow, let alone knew how to climb mountains with a crippling load of ammunition on their backs. Italy had a problem – and the solution was via ferrata. Insider tip: if you're a beginner, make sure to hire a qualified guide. Venice may have trouble with crowds but it's still remarkably easy to slip away and find an untouched spot. The secret? You'll have to find out how to get off the beaten path in Venice here. Most people visit Chiavenna as a day trip from Milan, or as they're passing into Switzerland. But the Valtellina area deserves more time. Explore deserted mansions, ski slopes, cheese cellars and a network of caves that residents have turned into fine eateries. Insider tip: try piping hot sciat with Valtellina wine. Perfection! Great list! I LOVED Trieste and the ghetto in Venice is spectacular! I absolutely loved Trieste too. I’m still so surprised by how off the radar it seems to be…Stunning place. I’ve done none of these despite multiple trips to Italy! Must change that. 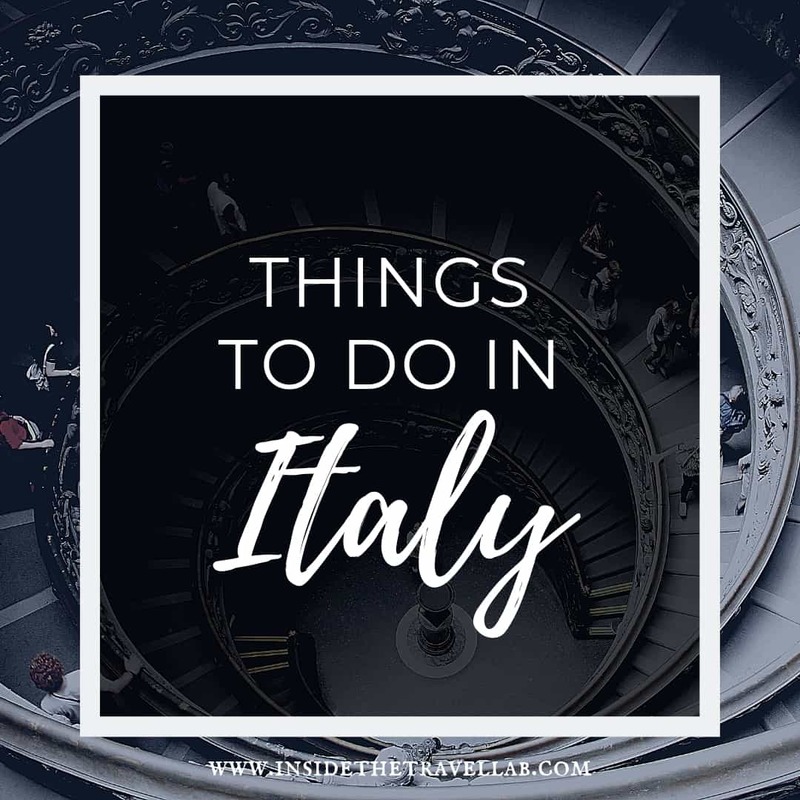 Well, as you know, I haven’t been to Europe yet but I’d love to do any one of these things when I finally get to Italy! I love the history behind Via Ferrata and I’m even more intrigued by it now that I know! Great list! We’d love to do the folk dancing! Not sure if this is considered unusual, but we would recommend going to see at least one Italian opera performance while in Italy. Tosca is my favorite! Ah…yes, I’m not sure if it “counts” as unusual but it certainly counts as “interesting” which is far more important after all. Any recommendations for where to see one? I’d love to do the Via Ferrata. Sounds like a fantastic way to spend a few days followed by some good food and wine in the evenings. Yes, it’s definitely the kind of activity that leaves you feeling that you’ve earned your relaxing evening! This is such a cool list! 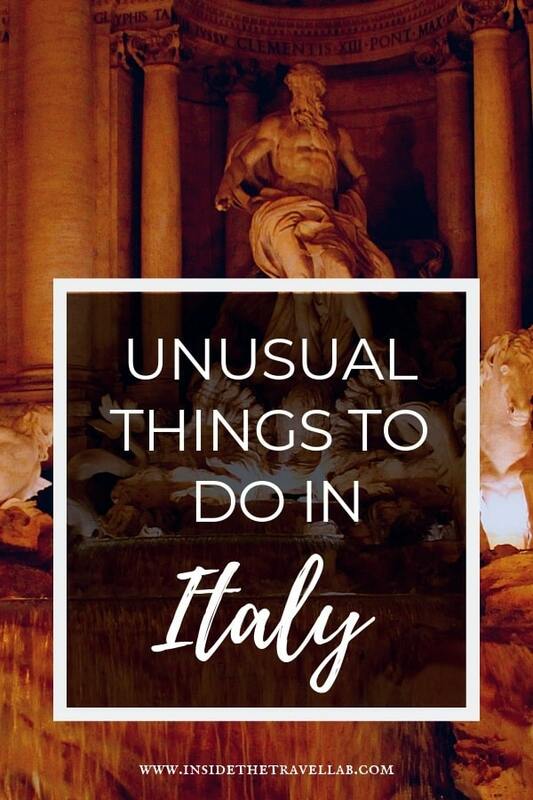 I love the idea of exploring some of Italy’s lesser-known attractions. Your photo of the view from the road from Amalfi to Sorrento is absolutely gorgeous; it makes me eager to walk the road myself! It’s one of the best walking routes I’ve done. Quite challenging (but not too much) and SO beautiful. Yet at the end of the day, you’re in an amazing Italian village with all the creature comforts you want. Perfect stuff. My favorite place in Italy was Positano on the Amalfi Coast. If you want a real adventure, take what I refer to as the bus trip of death along the Amalfi Coast. It will make you glad to be alive when you arrive. Also, Pompeii is a great side trip. Especially when you see the destruction to the city. Haha! The bus of death! Yes, I think I know what you mean. My knuckles actually did turn white. Unfortunately I never made it to Pompeii – I was still getting over some surgery and was advised that the walk was too far. So…it’s still on my list! I love this list! I esp loved Trieste, it turned out to be such a surprise :D Thanks for the rest of them. I miss Umbria! Ah, yes, Trieste surprised me too! Fascinating place -and such a beautiful central square. I’m excited to find this list! I’ve been to Italy and experienced all the typical locations, but it would be great to see Italy through unique experiences like these. I enjoyed your comparisons when describing Umbria and I loved your descriptions of the scents and sights of Italy. Taking a cooking class or experiencing a festival are awesome ways to explore any new place! Watch Befana festival in Florence, January 6th! And what is definitely worthy is exploring Puglia! Thank you, Abi, for a nice article!